Well, Melbourne is close to the Never Never. I went to First Site Gallery to hear the artist talks and meet Mojgan Habibi, one of the artists. Mojgan Habibi is an Iranian-born, Melbourne-based artist working in ceramics and calligraphy doing her Masters in art at RMIT. The artist’s talk by Mojgan was more a conversation as there weren’t that many people; there was just myself, an Iranian calligraphy teacher, Amir-Navid Molaverdkhani and his two girls. 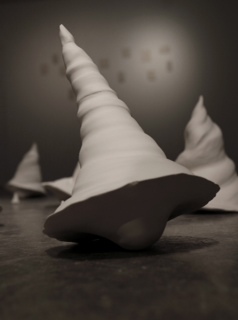 I had seen Mojgan Habibi’s exhibition “Spiritual Transformation” at First Site Gallery last Saturday. It had made me smile, the many white ceramic spirals looked impossible to construct. They looked so fragile but also like spinning tops balanced or spiral galaxies in the middle of the gallery floor. I enjoyed the frozen movement and meditating on the spiritual message of the spiral, in a spiral of thought about the whirlwinds that took the Prophet Elijah to heaven, whirling dervishes and the universe. The spiral is a universal spiritual theme and a symbol of the universe. We talked about the spiral form in terms of Maslow’s hierarchy of needs and cosmology; one of the girls thought that they looked like whirling dervishes too and also like, ice cream. 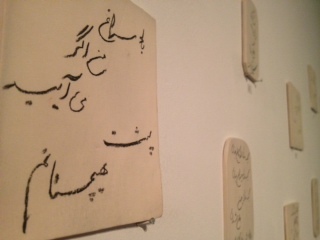 Mojgan Habibi, Persian Calligraphy, 2012, photo courtesy of the artist. “Spiritual Transformation” included a selection of calligraphy on ceramic tablets (the quote at the start is a translation of one of them) and so the conversation turned to calligraphy. We talked about the exhibition of Persian manuscripts, “Love and Devotion” at the State Library earlier this year. Mojgan showed off her calligraphy printed on her red t-shirt, in translation: “What passion, what passion, we are burning like the sun”. I like calligraphy I write about wildstyle graffiti even though often that I can’t read it any more than I can read Persian calligraphy; there is always the flow and placement of the letters. Later that day, while taking some photos in Hosier Lane for another blog post, I saw some tags with beautiful calligraphic qualities and felt it all come spiralling back.